Yes, that’s the number of downloads of the Avion Flight Simulator ™ game on the Google Play Store and counting. 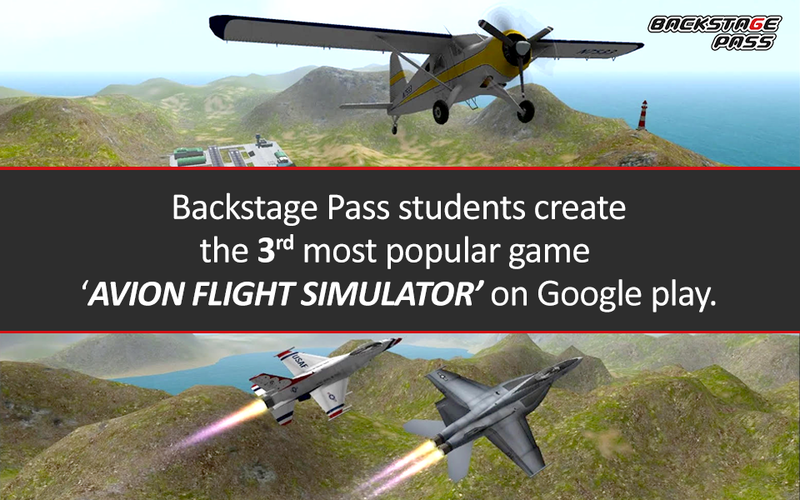 Students of Backstage Pass Institute of Gaming & Technology, Satish Chandra and Asar Dhandala, are the creators of the Avionics Flight Simulator ™, 2015 game. Currently, the game is the 3rd most popular game in the world among similar games on Google Play. Asar completed his B.F.A and Satish was a student of the PG Diploma in Game Design programme. Satish was a Systems Engineer at Infosys before he dropped out to pursue gaming while Asar turned an entrepreneur in his student days with Seven Summits. Here is the making of the game, in their own words. “While working on some project, we discovered that both of us have a penchant for aircraft. That got us both excited. We both started getting along very well and started talking more and more about the concept”. “I already tried to make a flight simulator game and failed once. 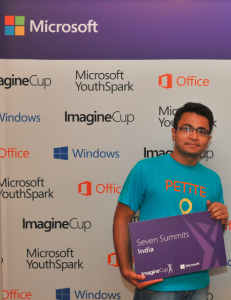 So, when I met Satish, I thought we could together build the game. Besides, he had already built two flight sim games through TeaPOT games with a million downloads each”, says Asar. “Initially we were coding like 6 hours a day. On one of those days, we met in the coffee shop to discuss the progress. I came to know that I had to travel to San Francisco for Casual Connect USA, 2015 and we joked that we should finish before I leave for the conference”. “Later we got serious about the jokes. We thought, why not?”, adds Satish, quietly. “That’s when the real game started. From 6 to 7 hours of coding a day, we jumped to 20 hours of coding a day”. Satish chips in. “Since we both liked flight simulators, we knew what to build. We took the most played simulator games at that point and analyzed each of them in our own way. Essentially, we were building our kind of flight simulator. Like kids who fancy a helicopter full of candy. We were no different”. “Marketing? That’s the craziest thing in hindsight. There wasn’t any:zero marketing. No user acquisition. No spreading the word around the world. We just joined the Play Store and the Microsoft Store. All that we did was every mobile near us had the game running on it. Friends, family, neighbours, just about anyone known to us”. Both laugh heartily. “The zero-day. That was a great moment. The zero-day retention was 30%. And that’s a winner. We knew it. After that, there is no looking back. The game took its own course. It has been totally organic”. A hush descends on the conversation, characteristic of experiencing something before the experience. Asar breaks the silence, “I guess all the right elements were there. While we designed the game together, we stuck to our areas of expertise. Satish was programming and I took care of 2D Art and visualisation. Satish is a very professional coder. Trust me, it is extremely important to have the right team in place”. “Besides meeting each other, at Backstage Pass we learned how to get into the game industry. This is a very important turn in our journey as entrepreneurs. And I went on to publishing my first commercial game. And, so did Asar”, adds Satish. Recounts Asar, “Backstage Pass helped me with partly financing some of my trips to conferences, gave me the freedom to work on my games and they spread the word of Avion”. 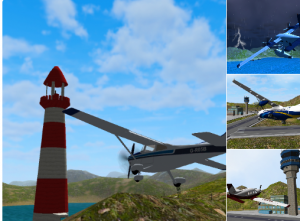 “We are working on the next version of Avion and we are also planning to come up with a new game by mid-2017”. “It’s perfectly OK if you are looking for a secure job. But to be an entrepreneur, you should fail fast, and fail early”, pat comes the suggestion from Satish. “You got to build many games before you have a winner. I made as many as 14 games. So just make. Make as many as you can”. Backstage Pass Institute of Game Development offers various courses in game design, game art and game development. Backstage Pass has collaborated with JNAFAU, Hyderabad to offer bachelor’s and P.G. Diploma courses. Backstage Pass alumni include entrepreneurs, employees of start-ups and MNCs, and students of acclaimed universities across the globe. For more information, please email to: info@backstagepass.co.in or call: 040-800 800 2794/800 800 2795. Our student and ace game developer, Asar Dhandala, a soft-spoken and yet dynamic person combining the charm of a college kid and the attitude of a self-taught entrepreneur, is blogging this week to give you a ringside view of game development. Like many others kids, I joined the biology stream after passing the school. I hoped to crack the medical entrance after my Intermediate (12th class). But within a couple of months into Intermediate, I realized medicine is not my cup of tea. It was super annoying to cut earthworms and later wash hands and eat food. Also, physics and chemistry didn’t excite me at all…. They just didn’t. And I just didn’t feel like I belong. Net, net …I started thinking. What do I do after Intermediate? I started searching the Internet for alternatives and chanced upon both Backstage Pass and an animation studio. I liked what I saw, and wanted to give it a shot. As soon as I was done with my exams, I joined the animation studio and learnt animation. Then I approached a Delhi-based game studio for an internship. Sitting in Hyderabad, I worked for them for four months. I attended training sessions on Skype and later read online about how to make games. 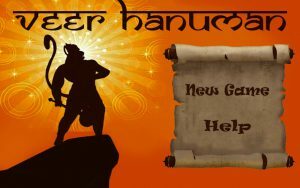 As a part of my internship, I made a game called Veer Hanuman. It became popular and had two lakh downloads till date. I didn’t make any money as it was an internship assignment but I learnt how to make games even before I stepped into college. And that turned out to be a huge advantage for me. Since this is a relatively new career path, I had to do something to convince my parents. After designing the Veer Hanuman game that became popular, my parents were convinced too. So I joined Backstage Pass. 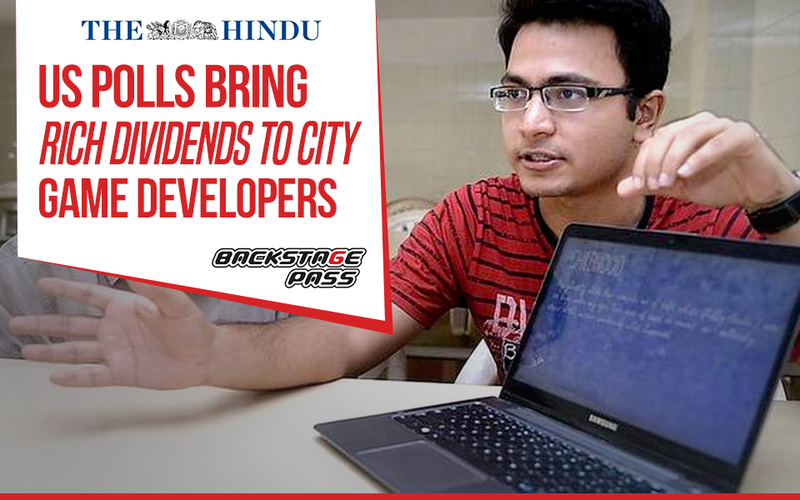 •Backstage Pass happens to be the first college in India to offer University-certified bachelor’s degree, of four-year duration, in Computer Science and Game Development and Bachelor of Fine Arts. Many institutions offer only diplomas but not a four-year degree. The degree is conferred by Jawaharlal Nehru Institute of Architecture and Fine Arts University, which is recognized as a State University by the University Grants Commission (UGC). •A four-year bachelor’s degree puts you in a sweet spot as some countries mandate 16 years of study (10+2+4) to grant a work visa. 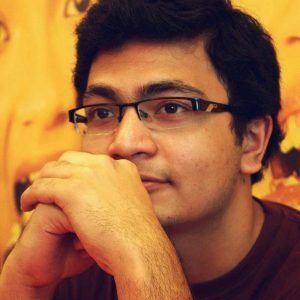 •And I knew, through my internship experience and building the Veer Hanuman game, I could do something on my own. Yes, Backstage Pass supported me well. And it did so, in more than one ways. The faculty taught us well. We had the freedom to explore and build. That is very valuable. All the students receive support to market their games and to visit the overseas game competitions. In hindsight, I see that Backstage Pass is a very good place to learn the tools and exercise your talent. Experiment, fail, and revise. That is the key. Every month, 30,000 video games are released for the mobile platform but only 8 to 10% of them succeed. So the odds of failing in making a commercially successful game are very high. However, that is where the fun is. While failing quickly, we learn non-stop and also know what not to do. I wanted to take home more freedom and money than a job could afford and also wanted to do something different to engross me and prove myself. So I turned into an entrepreneur when I registered my business, Seven Summits Studio, in my freshman year in 2012. And I started making games. Also, I felt that college is the right time to fail because no one would question me. I learnt that it was not easy to manage teams because you were inclined to share profits rather than pay salaries upfront. That made it difficult to bring enough loyalty to function as a team. I traveled to participate in competitions held in Singapore and Seattle. This is a very high cost affair and Backstage Pass supported us. My games started getting noticed in 2013. The release of Petite and Avion saw us receive a host of awards. Petite is an ambient experience game built to trace the journey of a woman. This game won the Indie Game of the Year at NGDC, 2015. It carried three lakh rupees of prize money. This is an award given to a game whose intellectual properties are owned by an Indian entity with less than 30 contributors and is self-funded. NDTV described the game as one of the “Top 5 Android Games from India You Must Play”. I am working on a train cruising game and planning to release it next month. Prior to 2010, service companies dominated the Indian game development scene. They would mostly execute outsourced work. However, post-2010, I see a rise in independent game development. The increased mobile phone usage and the potential for mobile adoption in India are pushing Indian game development to new levels. I firmly believe that game development is a strong career path that can push you to utilize your creative juices. And that is the way I see the world going.